Roland Petersen, Coffee Break, Acrylic on canvas, 62 x 71 in. For over six decades now, painter Roland Petersen has been spreading out visual feasts across his expansive canvases. 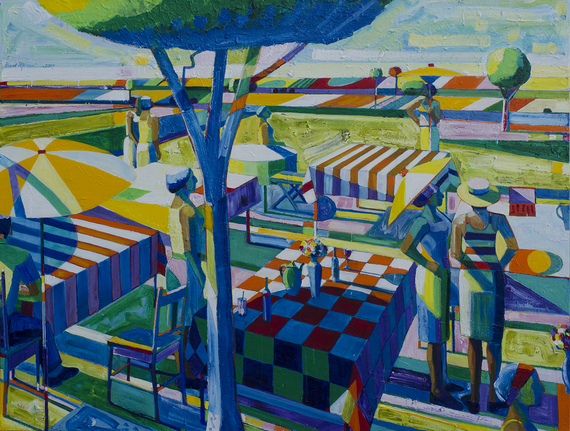 Firmly grounded in perspective yet also brimming with painterly vitality, Petersen's cityscapes and picnics show what an ambitious artist can do over a long span of time to create variety within a consistent structure. Using a striking range of geometry, color and form, Petersen conjures up an engaging and seemingly endless world that seems to stand still within the boundaries of time and space. 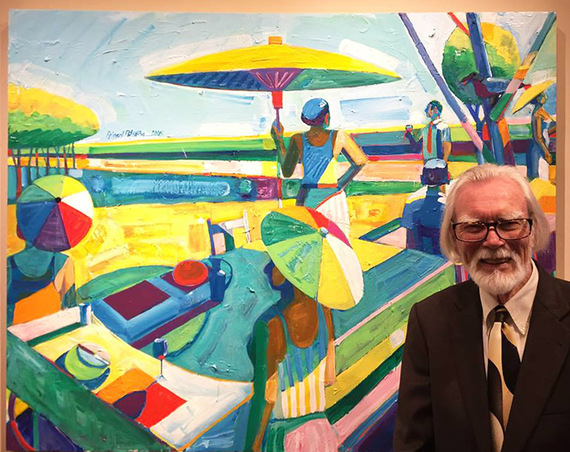 I recently spoke to Roland Petersen a few days before his 90th birthday to learn more about his life, artistic career and recent work. Roland, I understand that early in your career you taught art history. Yes, I taught art history beginning in 1952 at Washington State. I was there for four years before coming to UC Davis to teach studio art. Coming to Davis as early as you did -- in 1956 -- you arrived long before some of the other notable UC Davis studio art faculty members, such as Wayne Thiebaud, William T. Wiley, and Robert Arneson. I was the second person hired by the department chair, Richard Nelson, and the first painter. 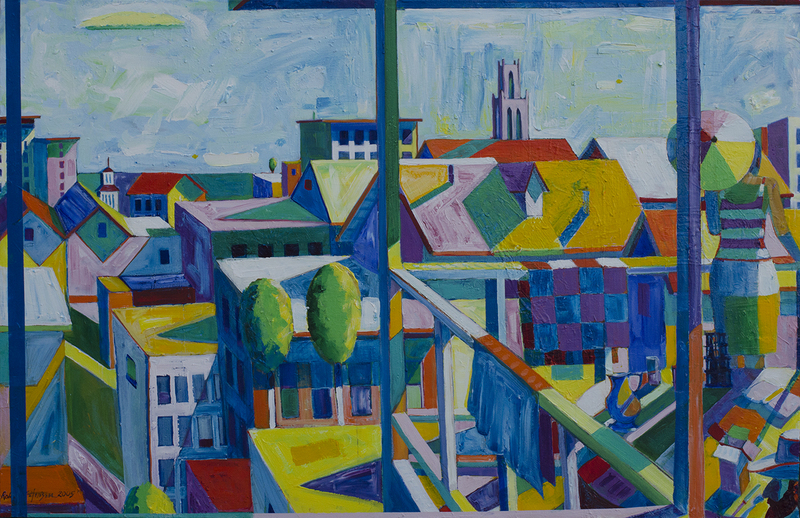 Roland Petersen, San Francisco Rooftops, Acrylic on canvas, 45 x 70 in. Given your long history in Northern California, what is your connection to the Bay Area Figurative movement? I wouldn't say that I'm part of the Bay Area Figurative group as such. My work comes from a different point of view since I studied with Hans Hofmann in Provincetown. The idea of the "push and pull" that Hofmann taught was coming from a different basis than the approach of Clyfford Still, who influenced Richard Diebenkorn, David Park, Elmer Bischoff and others. Yes, Still was interested in pure abstraction and flatness. Your work certainly has an abstract aspect, but also a deep engagement with space and geometry. I like geometry very much and because I liked the kind of "push and pull" that Hofmann was teaching, I tried to incorporate the figure into that spatial concept. Those interests must have led directly to your best-known paintings, which are sweeping images of figures and still lifes set in landscapes. Yes, I call them my Picnic Series. I started making them in 1959 and I've been making variations ever since. 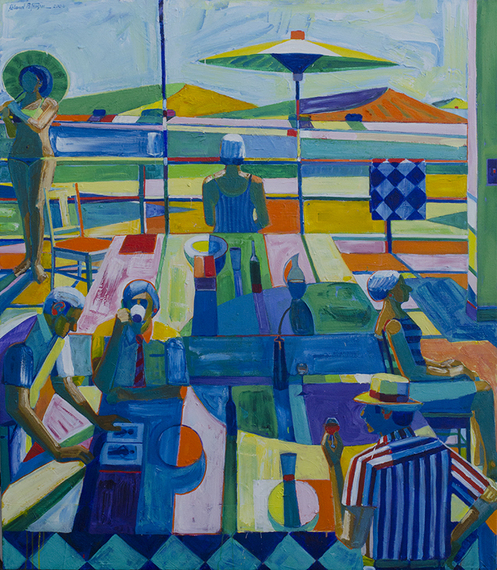 Roland Petersen, Conversational Picnic, Acrylic on canvas, 65 x 86 in. Well, yes, the whole thing started with the Picnic Day celebrations that were held each year at Davis. 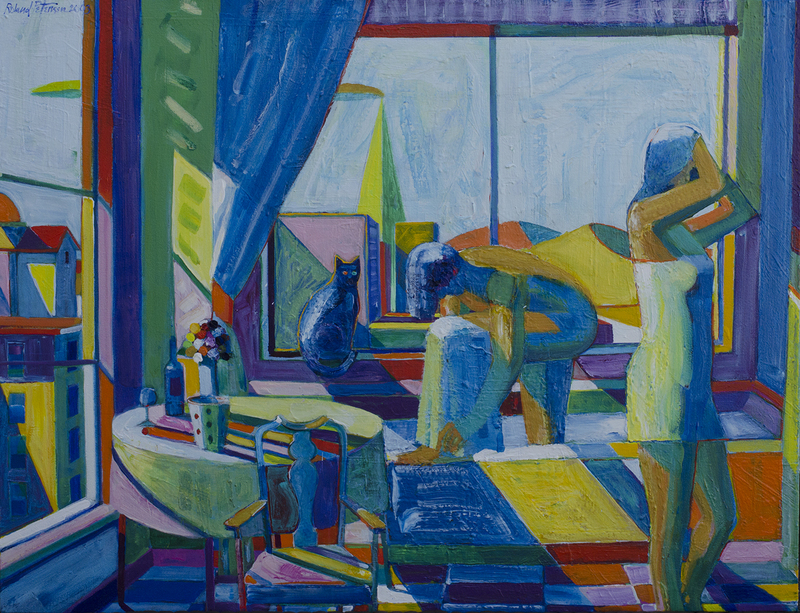 That sort of set off the theme -- figures in a landscape -- and it also gave me the opportunity to work with still life. I was trying to relate the landscape to the still life and the still life to the figures so that all three of those might work together in a certain type of relationship. It strikes me that the way you place your figures in space creates a kind of tension and thematic distance. That's what I am trying to do in my compositions: create an almost nostalgic loneliness. The figures are being separated by space, but they can still relate to one another. I like the feeling of isolation, where the figures seem to be in their own worlds, sort of daydreaming. 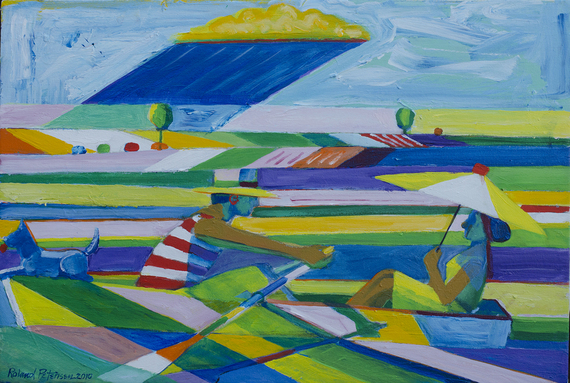 Roland Petersen, A Row Boat for Two, Acrylic on canvas, 25 x 36 in. The sense of dreaminess contributes to what you have described as the "aura of timelessness" that your work attempts to generate. The figures are not aware of the present, or of the others around them. One influence has been the work of Georges Seurat: not the Pointillist technique, but rather the feeling of them. Yes, I have heard it said that Seurat's figures seem to glide on rails. I haven't heard that before, but I like it. I also enjoy ancient Egyptian art, and the rigid, statuesque feeling of the sculpture. What role does color play in making your work come together? My color theory is very important to what happens in terms of space because I set up a kind of code as I work. I create a home base of several colors and try to repeat that in as many patterns as I can. Each painting starts with a kind of sequence of colors that establishes what happens after that. Can you give me an example of how that might work? I might start with a home base of -- well -- it could be anything. Just say, hypothetically, I might start with a dark green line. Attached to that line I might have on one side a yellow line and on the other side there might be a pink line. That could then become the basis for patterns that might exist in other parts of the painting. As I'm thinking about what goes with the yellow I might try a light green as opposed to the dark green line that I started with. Or, it might be a blue or whatever color I establish to go with the yellow. On the other side is a pink, so I say to myself, "What might be a good color that would work with that?" I might choose a violet, or whatever color it is. So I establish that kind of order, and that is repeated as often as I can. Then I make variations on the light green line/pink/violet and I keep building up other colors to associate with those starting colors, and that establishes the whole rhythm of the painting. 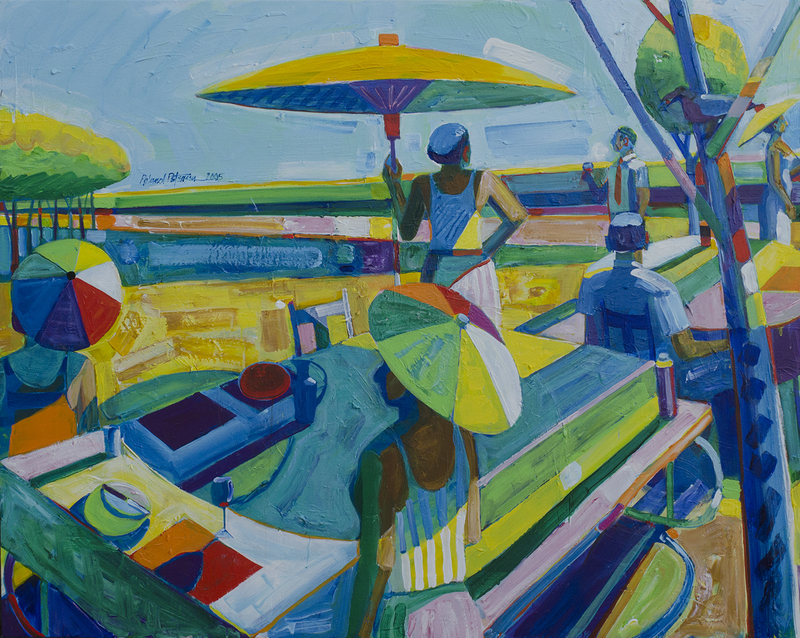 Roland Petersen, Six Figures with an Umbrella, Acrylic on canvas, 48 x 60 in. Yes, I notice that there is a great deal of color in your lines and edges. I like colored line especially and tend to use it to connect forms. Also, haloing a large area with a complementary color seems to give an added vibration to the color. In terms of the lines that I use to structure my compositions, I try think as spatially as possible. So hypothetically, a line in the landscape can attach itself to something in the foreground so that it has traveled in space, coming forward from a distance. You really find ways to activate the entire surface of the canvas. In your cityscapes, I noticed figures in borders and on corners. I like an open composition and it's not unusual for me to have half-figures or heads coming in from the border. I often have a half-figure on the edge, and then I'll put another half-figure on the other side: The part that is missing makes a full figure if you put both halves together. Roland Petersen, City Rose Bathers, Acrylic on canvas, 50 x 63 in. Am I right that your color has gradually become brighter in recent years? Yes, this is due to my use of acrylic paints instead of oil. I made the change for health reasons. There is a different give and take now as the paint dries so fast and doesn't allow me to move the paint around. The recent work is more compartmentalized as opposed to an interlay kind of thing: It's coming together more as a pattern. Have you been influenced at all by the work of Wayne Thiebaud? I think there is a relationship going there -- not so much in terms of Pop Art, but in terms of ideas about color: There is some echoing going on there. The ghosts of many different artists are present in my work. It's hard to keep away from what is in the atmosphere around you. What do you hope people will notice and enjoy when viewing your paintings? Well, the first thing I'd like them to enjoy is the color patterns -- that's what I'm really intrigued with -- and also the imagery. Picnics tend to be a kind of happy occurrence, but in my picnics the contradiction of the loneliness creates a different kind of feeling.